My sewing room has finally moved. I now have windows to look outside, even though they are at ground level. No painting or beautification, just a lot of cleaning and moving and sorting. Not a pretty room, but my thinking is that I will tinker with the layout and organization of the room, so that when I finally get to the point where I can paint and beautify, it will be a simple matter of moving things away from the walls, painting (and all the rest of the mess that comes under that heading), then moving things back to their proper spaces. At certain points in this drawn out process, I was able to sew. Then I tackled the business of attaching shelves to the wall, screwing hooks into the ceiling for work lights, and generally creating mass chaos. In the midst of all of this, we had a tornado warning. No actual tornado, but quite a thunderstorm, which resulted in puddles on the basement floor in my "new sewing room". Had to find the source of this annoying inconvenience. Found it! A tiny little spot on the roof where the roofers missed with caulking. Now there are different ways to deal with this. Call the roofers, wait for roofers, wait for something to get done. The other option is to go to the hardware store, buy a tube of roof goop, get up on the roof and deal with it. I chose the second option, and now I'll just have to wait for the next thunderstorm to see if I was right. (Lovely view of the neighbourhood from my roof, by the way.) Unfortunately all of this did not help the mess in the basement. Hopefully to-day I will be able to move things back to where they belong, and get back to sewing. I have to have all my samples for sewing classes done by Labour Day (can't be that it's only a week away! ), so that means I'll be spending lots of time in my "new" room, which had better now stay dry. My sewing and picture-taking are now completely out of sync, not to mention any semblance of plans for sewing, but I'll try to catch up within the next few posts. One of the things that I did in spurts, is this dress for my mother. This one was a looong time in coming. Way back n 198? my sister made a dress for my mother. It was too full, didn't sit right, the neck was too high, etc., etc. Bottom line - it did not get worn. It hung in my mother's basement, unloved. A few years down the road I was asked to "fix" it. Several more years down the road, I picked apart all the seams, washed and pressed all the pieces, hung them on a hanger, and there they stayed for many more years. The fabric is nothing spectacular, and any sane person would have just tossed the pieces long ago. But I had promised, and I really do try to keep my promises, so the only thing to do was to lay out all the pieces and figure out something. I loosely followed the pattern that I generally use for my mother to cut down the excess width, fiddled with the neckline and put in a short zipper in the front seam (the only one in a colour that matched that I had in my zipper drawer). Goodness! It's been ages since I've done a centred zipper in anything! Guess it looks all right. Now it's done. Promise kept, even if it did take a few decades. Funny how time just flies by, but things just sit there to remind you of all that you have not managed to accomplish. It can be rather overwhelming. Just for good measure - the back view. Now I really must get back to clearing up this mess around me, or I'll not accomplish a thing in the way of sewing. A great big thank-you to everyone who participated in this giveaway. All the ideas for possible projects sounded wonderful. Finally I make the shirt that caught my eye in the first place on this pattern envelope! Pattern bought - several years ago. Made a white shirt (short, to tuck in) last fall. Recently (cleaning up strange piles of stuff that grow in various corners) I came across pages torn from a magazine from several years back - with this very pattern, View D circled in marker. Oh well - it's done now. In eyelet, no less! Mine is beige, not white. I even managed to style it! (I'm having fun with this modeling assistant.) Even managed a pair of leggings (capri length) out of the leftovers from the previous dress. Love the leggings! 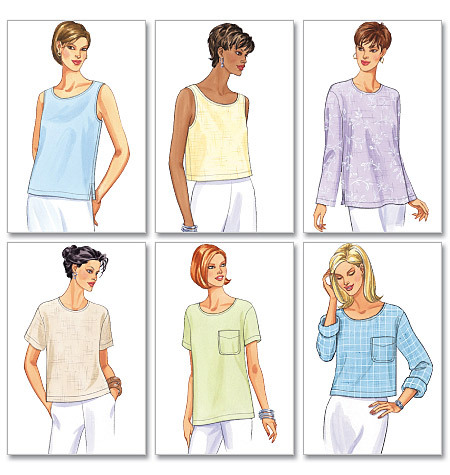 I used an old pattern that I had, Kwik Sew 2303, which is no longer in print. I didn't even realize that I had a pattern for leggings. With all the leggings showing up on other blogs I went digging in the pattern drawers, and there it was - never even used. Leggings are so very comfortable. I was afraid of looking "wrong for my age", aka indecent, but with this length of tunic/shirt I think it works. The ultimate test - mother walked through the door, noticed the new outfit and pronounced it "decent enough". Guess I can venture out into the streets in this get-up. I only had one slight problem with the shirt. The 3/4 (bracelet?) length sleeves look fine. They look particularly fine with bracelets. Unfortunately, they are rather tight, and unless all I plan to do is sit around and look pretty, that makes the whole shirt uncomfortable. Solution was to roll the sleeves up for normal daily activity, but to accomplish that there can be no arms in the sleeves at the time of this operation. So - I'll have to keep in mind what the planned activities of the day will be when wearing this shirt and remember to roll sleeves up before getting dressed when actually planning to get any work done on the given day. And - that's not all! After the DKNY dress and the leggings there was still some of that brown fabric left - just enough to make this t-shirt. Again, another OOP Kwik Sew pattern (3120) that I had. I just wanted to try out this raglan sleeve t-shirt. And that's the end of that brown fabric. All the rest of the scraps were cut into Swiffer cloths. Guess that's what's called "good to the last drop". One last reminder - tomorrow is the last day to leave a comment for the giveaway. On Thursday morning I will make the draw - don't promise to figure out that random generator thingy, but I think that the highly scientific method of putting all the names in a "hat" works pretty well. I swore that I would stop buying patterns on a whim, the result of which is that they sit in the file drawer not getting used. I had plans to sew up all (or quite of few) of the items that I have had whirling around in my head from last summer (or even from the summer before that). But no, I was swayed by the lovely, easily sewn DKNY dresses. I even happened to be in the fabric store (buying thread - nothing else!) when Vogue patterns were at a reduced price. Two patterns came home with me. That was back at the beginning of the summer. The patterns sat, and sat, and sat. First the excuse was that I had no fabric that would work. Then I found fabric in the stash. Still I procrastinated. Why? I convinced myself that I would have problems with the fit in the bust area. I envisioned every other possible problem. So then I decided to get myself in hand. I was not going to let this pattern sit around till next year. No way! It only takes a few hours - everyone has claimed that. Everyone looks fabulous in their versions. I did it! I still managed to drag this out into a two-day ordeal, but it's done. I made this up from the leftovers of a t-shirt dress from last fall ( I had bought extra - lots of extra). It's cotton/poly knit in my favourite colour - chocolate brown. I cut size 8 at the shoulder, zoomed over to the size 6 at the underarm and zoomed back to the 8 at the waist. I still had to take in a fair bit more at the underarm/bust area. I was prepared not to like this - don't ask me why - but I do. It's a t-shirt dress with a little style. The cowl does hang differently on me from what I've seen on other people's blogs. Guess that's to do with not having enough up front to hold the folds in place. I supposed you've noticed - I have a new modeling assistant. The self-photography was really taxing. Add to that, that I detest trying on clothes. When I'm wearing a new garment, the weather never seems to cooperate, and all in all I needed a solution. This is supposed to be fun, this blogging thing, not a chore. So - off I went to the place that sells store fixtures and hangers and I found the half-body hangers. She's not quite my proportions, but at least I can get my clothes on her and buttoned, unlike dressmaker dummies. The funny thing was - on the way to the store, for some reason I decided that I would not pay more than $20 for this contraption. The price on the sticker was $19.99! I'm happy. I think that photographing clothes on a plain hanger just doesn't give the right impression - this is a much better (if far from perfect) solution. Just a reminder that there is still lots of time to leave a comment (if you haven't done so already) on the previous post to get into the draw for the giveaway! This gorgeous piece of Thai silk can be yours - for the price of leaving a comment, telling me what you would make out of it. I only ask that you also be a follower (yes, a shameless plug for more followers than I already have). Comments can be left up till (and including) next Wednesday, August 17. I will then draw a name for a winner. Details - this fabric is a little more than 3 metres long, 104 cm wide. I tried photographing in various light conditions to get the exact colour, but didn't quite succeed, so to describe - there are two colours of thread - Christmas red running lengthwise and Christmas green running crosswise. Depending on how the fabric is turned, it looks either green or red. This piece was given to me by a friend who lived in Thailand for a while. When she could no longer sew, her stash moved to my house. The story I was told, is that this piece was handwoven to order. There are a few minor imperfections of the sort that I would expect in a fabric of this type. It's weight is similar to a light-weight duppioni, though much smoother. It's beautiful - just not my colour, and I really would like for it to go to someone who will actually use it. So - please leave your comments. Oh - I will send anywhere in the world. When I need to think - I sew. 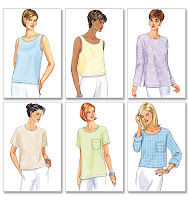 Nothing that requires thinking about the sewing that's going on, and that rather narrows the possibilities. Pyjamas always work well, and there is usually some piece or other in the stash that couldn't possibly be used for anything else. Really - what else could you make out of this fabric? Not fit to be seen in public! (Oops! I'm showing it to you.) In my defense - I did not buy this fabric. It was given to me. A wonderful soft cotton. Perfect for summer. But those colours... At one time I thought to make a hippy-dippy shirt for my son, when he was going through his hippy-dippy phase. Even he balked at this, and now that phase of his life is over, and the fabric sat there. Well, it is now in use, and the dog still recognizes me, even in these pyjamas (but they do feel wonderful!) The pants are some conglomeration of patterns that I came up with at some point, and all my pj bottoms are made this way. The top is Butterick 5948, which I've had for eons, and I'm amazed that it is still in the catalogue. I don't use the facings - I simply use bias strips to finish off the neck and armholes. And then there was this piece of amazing rayon - amazing because it feels like butter - but those hunting horns! As I recall this piece of fabric came with a bundle of fabric from a store that made/sold children's clothing, and I believe that they were going out of business. Anyway - all the other fabrics got used - don't even remember for what, or what they were. This piece just didn't "do it" for me. I just couldn't imagine a blouse or dress with those horns, or, I should say - I could imagine such a garment, and I just couldn't imagine wearing it. So, finally, after decades in the closet - a very useful item. I have a cream cami that works with this to make a full fledged pyjama. One can never have too many pyjamas - and this was like getting them for free. How much better can you get? And what I needed to do serious thinking about - I'll let you in on that soon.